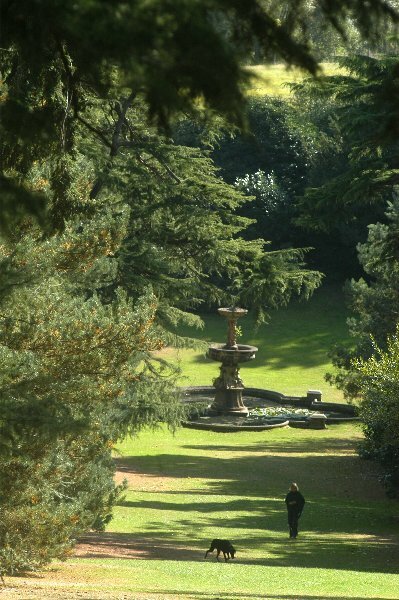 Conservation at Dunorlan Park in Tunbridge Wells may have prompted vociferous objection from a minority, but the returning glory of Dunorlan Park, now in the last throes of summer, is indisputable. With rich grass carpeting the previously mud-churned landscape and rigorous growth of new and pruned shrubs and trees, the startling scenes of disruption when the £2.8 million restoration got underway seem a distant memory. Even the Cedar Avenue, with its sweep of 50 fledgling trees enticing walkers down the grassy ride from the temple to the soon-to-be cascading fountain, shows promise for the future. The felling of the raggedy cedar and fir avenue caused the biggest outcry from complainants – but the new Deodar Cedars standing resolutely proud, despite their young age, will tower majestically in future years. The project has taken just one year to complete, and the park will open at the end of September – giving visitors a chance to see the vast amount of specialist work undertaken – including by terracotta restorers, who are also renovating at St Paul’s and the Royal Albert Hall. Some painting will continue, and the last sections of the fountain will be returned in early October. Standing at the top of the avenue, and considering the fruition of the past year’s hard graft, Tunbridge Wells Borough Council head of Leisure Services, Nigel Bolton, said on Friday: ‘It has been a very exciting and satisfying project, but hard work. I think people will be surprised at the quantity of mature trees and shrubs that have been retained. It’s been kept within budget, and on time. We don’t want any rain for the next three weeks or so, and then we want lots of it!’ A hold-up caused by the exceptional August rainfall in the Pembury Road-end car park, where the special car park surface – fibre glass laid very hot, and stone rolled in to it – needs ‘very, very dry weather’ to be put down. In front of the Chalybeate Spring are York Stone steps with balustrades, and an elegant terrace overlooking new formal beds, replicating the 1860s design. The oldest tree in the park – an ‘ailing’ 350-450 year-old twisted and gnarled Yew – has undergone vast arboricultural work, and is now enjoying a new lease of life. A lot of underground engineering work will not be seen by the public, including an irrigation drip in the avenue, and a massive underground tank which will pump water into the fountain and the cascade – meaning year-round flow, even if the lake’s water level is low. The Grecian Temple – where children love to press their noses to the glass, and gaze on the naked statue inside – was built by the renowned Pulham family of Broxbourne, in Hertfordshire. Four generations of the family worked all over the country between the 1850s and the 1930s with their Pulhamite stone, including at Buckingham Palace. 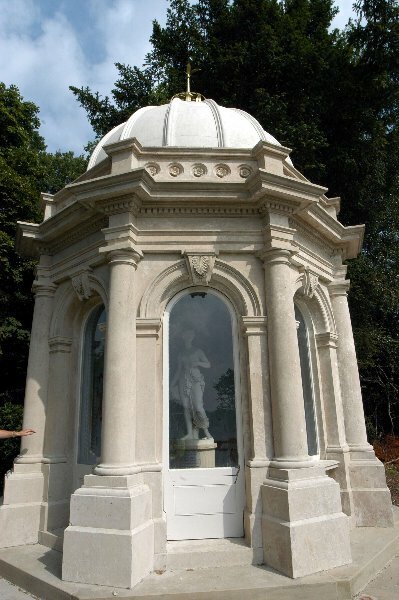 Made from Portland Stone, and some Pulhamite, the temple, which stands at the top of the cedar avenue, has undergone a £30,000 restoration; however a further £50,000 is needed for further restorative work. One aspect of the park which really thrills Mr Bolton is the 1860s rockery – also by the Pulham family – which has until now been covered by rhododendrons. Another Monkey Puzzle was discovered = again previously shielded by trees – and two more have been planted near the top car park. Children who love scrambling over the large fallen tree will be glad to know it has been kept. The new boat store, built with ‘gabions’ – stone-filled wire baskets – is a ‘one off,’ due to its unusual building technique, and the new boat kiosk clad in cedar replaces the small boat house. The Matchett brothers, who have run the boats for 56 years, have used this summer to repair their boats. The 42-space Halls Hole-end car park has an improved lay out and has been resurfaced, and the refurbished cafe will open in early October. Managers also used the project as an opportunity to treat any injured geese, ducks and wildfowl, and the Grey Leg geese, which now number about 115, have gradually returned.